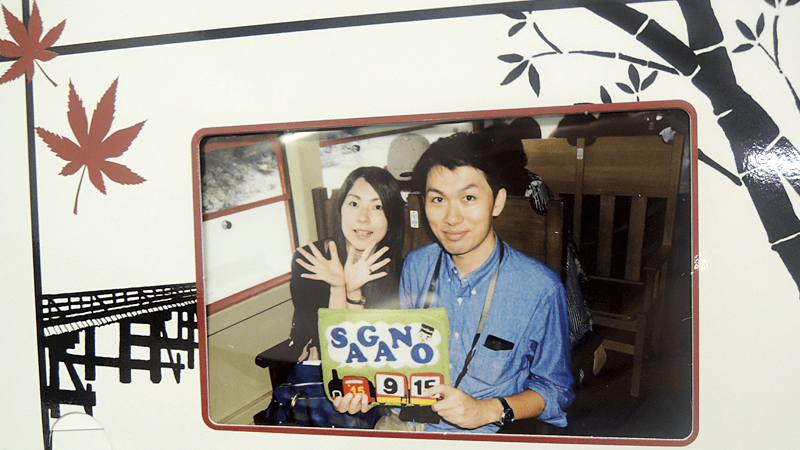 A three-hour journey to Arashiyama on Sagano Romantic Train! 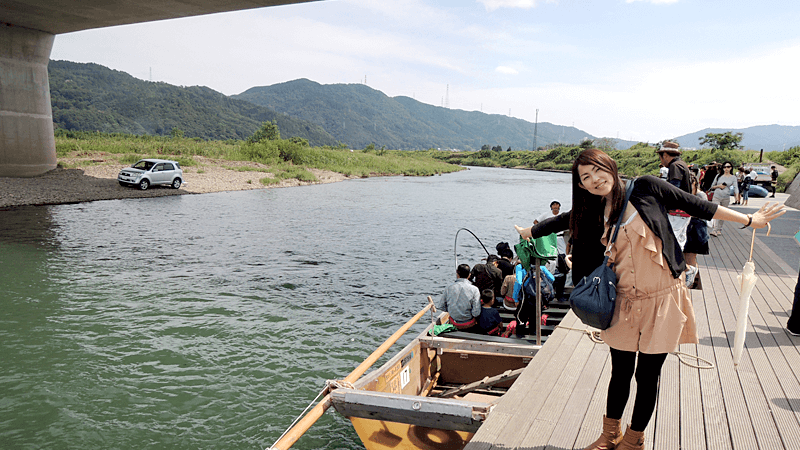 One of Sharing Kyoto's writers had never been to Arashiyama, so we had to take the romantic train and boat there and experience it all. 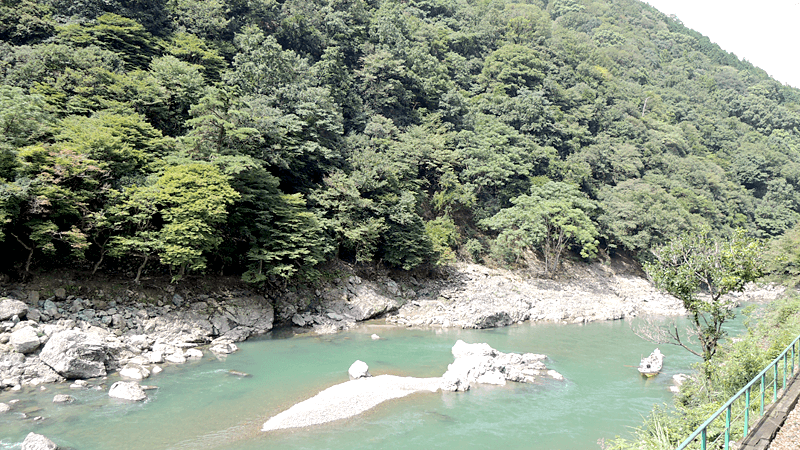 "I’ve never been to Arashiyama," our staff member Yoko told me. I thought it was such a shame for her to be in Kyoto but never having seen Arashiyama, one of the city’s classic sightseeing spots. 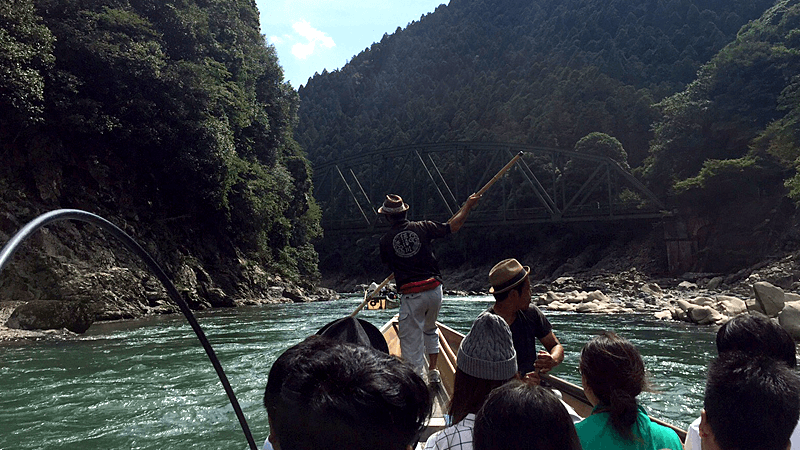 So we started talking about how if we went, we should go by way of the Sagano Romantic Train, with its beautiful natural scenery, and the fun-filled Hozu-gawa River Boat Ride. The weather was great the day we went. It was crowded with tourists, including some from overseas! Get your fill of the great outdoors from a diesel locomotive! 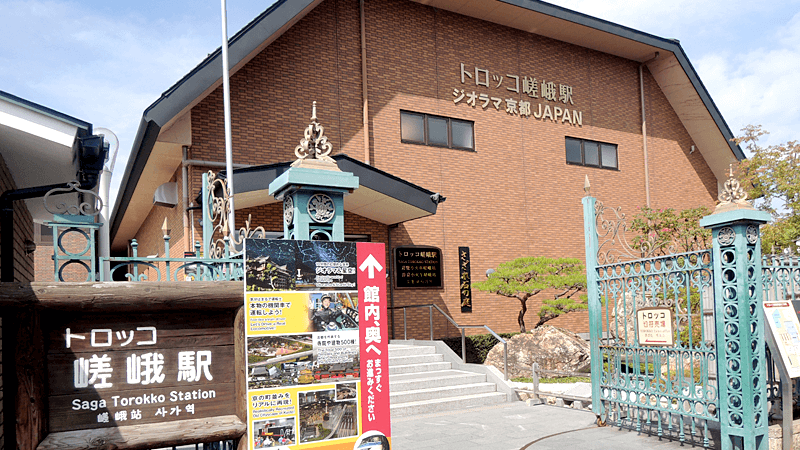 First you have to head to Torokko Saga Station to catch the Sagano Romantic Train. Take a 12-minute ride on the JR Line from Kyoto Station to Arashiyama Station. Torokko Saga Station is a three-minute walk from there. 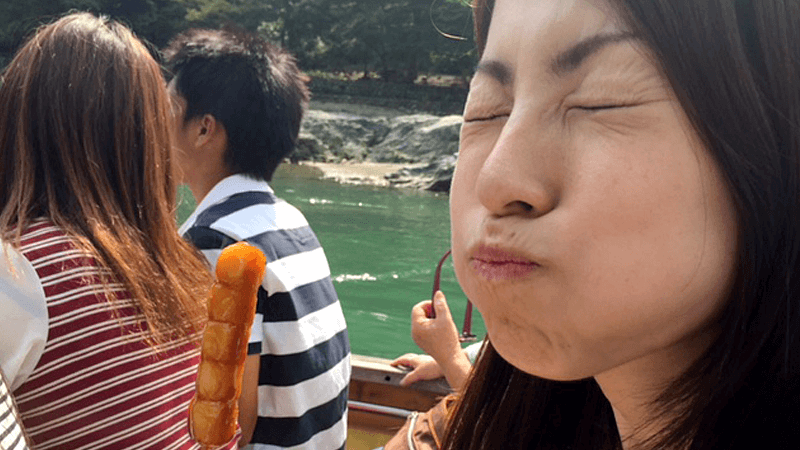 Here you can purchase tickets for the Sagano Romantic Train (One-way/Adult ¥620) and the Hozu-gawa River Boat Ride (Adult ¥4,100). Exterior of Torokko Saga Station. Awesome! 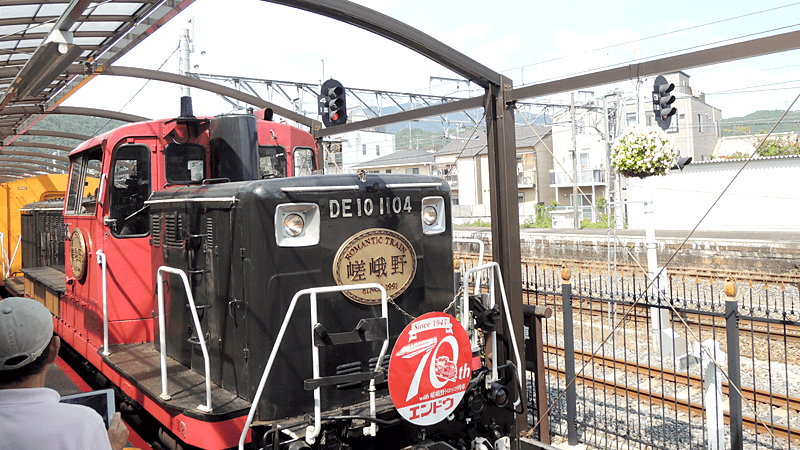 Tickets for the Sagano Romantic Train sell out during busy periods such as holidays. If there are no seats left, you might be able to buy standing-room tickets. We recommend buying tickets in advance, or arriving early if you want to purchase same-day tickets. We waited on the platform, and the Sagano Romantic Train pulled in! It is a lovely diesel locomotive. Everyone took out their cameras in unison to snap some pictures. We took some photos of the train and the people around us, too! Very charming colors and design! 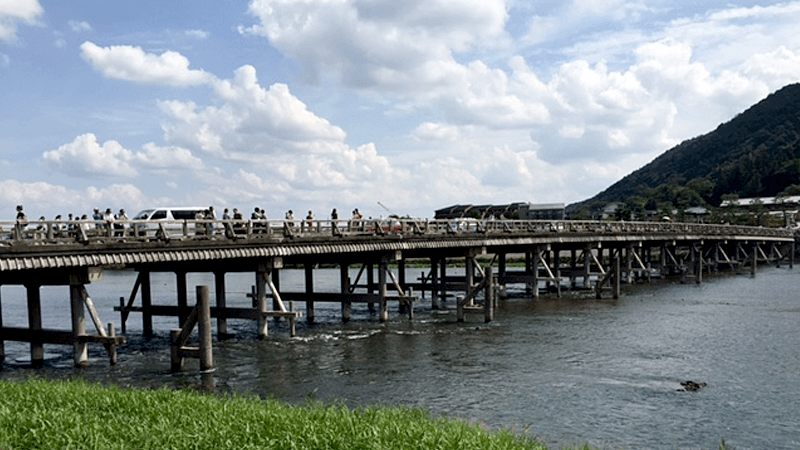 From Torokko Saga Station, it is about a 25 minute ride to Torokko Kameoka Station near the boarding area for the Hozu-gawa River Boat Ride. The train travels through mountains overflowing with green trees. The scenery through the window is gorgeous! Pull into Torokko Kameoka Station! 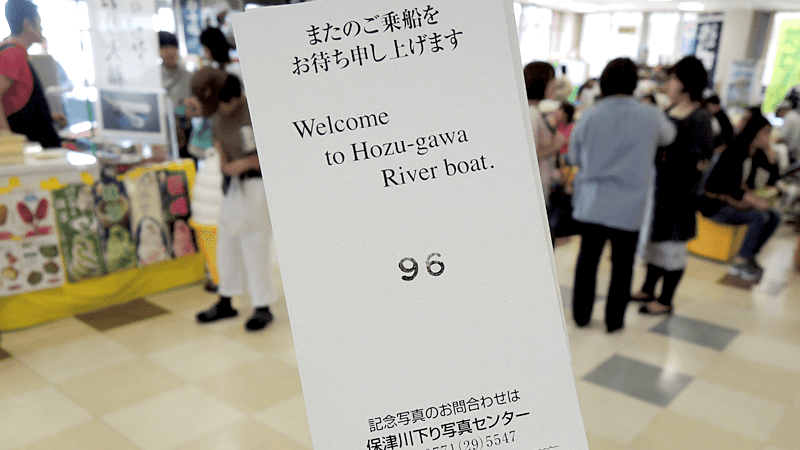 From here, a bus will take you to the boarding dock for the Hozu-gawa River Boat Ride. A trip down the river, both soothing and thrilling! After about 20 minutes on the bus, we arrived at the Hozu-gawa River Boat Ride! On the 2nd floor of the building, you will receive a numbered boarding ticket. You then wait in the waiting area until your number is called. The announcements are also made in English. My numbered ticket. Standing by until they call 96! Once they call your number, you can finally get on board! One boat can carry about 20 passengers and 3 boatmen. The boatmen use special poles to keep the boat balanced. 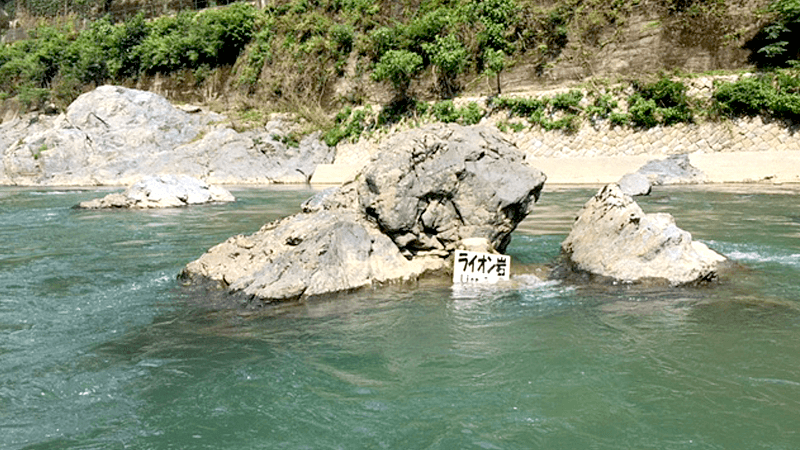 At first, the river current is very calm. The boat floats along at a leisurely pace. But then we suddenly hit a rough spot in the river! We accelerated rapidly into a nosedive! It was a complete thrill! Amazing whitewater spray! The green plastic defends against water pouring in! 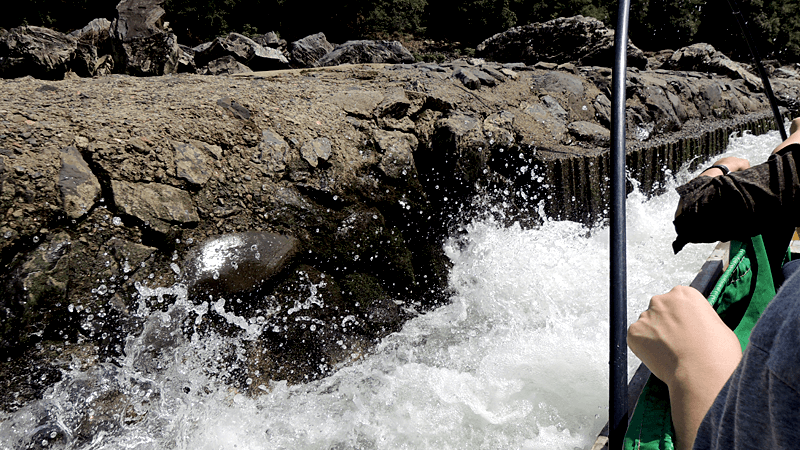 The boat advanced through the great outdoors while occasionally encountering thrilling rapids. The surrounding scenery is really beautiful. And at times you will discover rocks with amusing, unusual shapes! 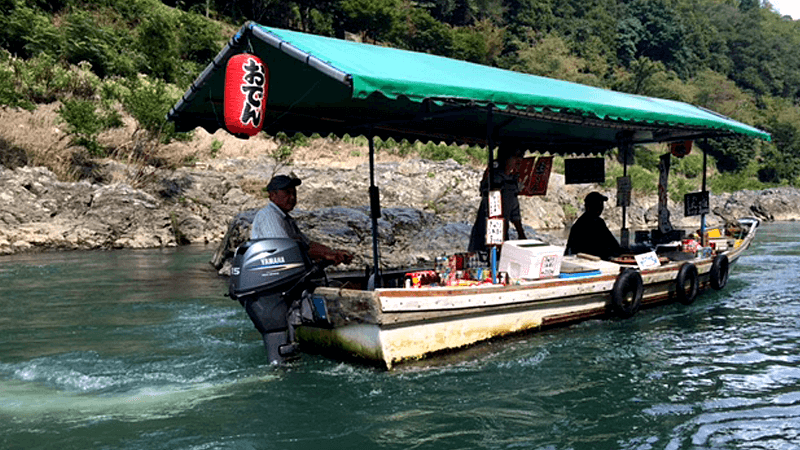 At the final stage of the journey, we came across a boat converted into a food stand. 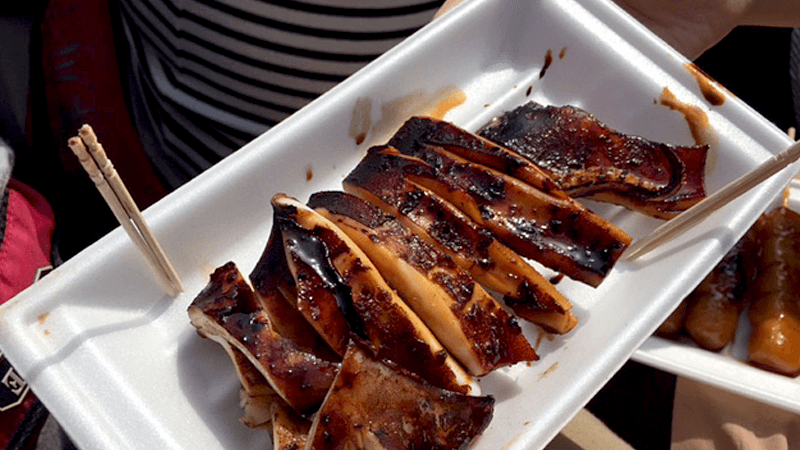 They sold snacks like dumplings, grilled squid, and oden, as well as beer and soft drinks. Time to replenish our energy! We then arrived at the last stop, Arashiyama. The two-hour boat trip was a lot of fun! If you catch the trolley in the morning, you can make it to Arashiyama by about 1:00pm. Then you can take in the sights around Arashiyama until the sun goes down! On clear days, you will get a lot of sun, so remember to bring a hat and sunglasses!